Which side do you generally side with when making decisions? 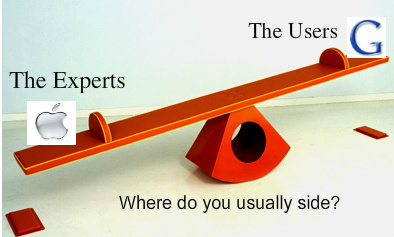 Do you make decisions based on your expert knowledge and experience or do you lean towards the data and numbers? I’m asking because I’ve had some interesting conversations in this regard, with a colleague. How some companies (or people) make decisions based on their own sniffer. How others are very rational and go where the numbers and crowd (or mob) point. The question isn’t just academic. When related to education I think it really has some significance. Of course we have all the data driven, test score driven administrative tom follery. I’m not going to discuss this silly stuff. If you can’t see that emperor has no clothes, well, then dream on…..
No, I want to look at how teachers make decisions in their own classroom. Are we like Apple, generals and experts that know and with our charts, handouts, videos, textbooks – steering the ship of students? Or are we listening to students and letting them take hold of the wheel and allowing them to steer the ship? Of course, most teachers will say that they are the later, they are googlites, they listen to their students. This is the mantra of modern education. However, me thinks this is only cosmetic. Look deeper and almost all teachers are governing their class as “experts”. We truly don’t go down to the level of students or listen to them. We all say that we “listen” and are “data informed” but when push comes to shove – I believe we teach as we were taught. We perpetuate a worn and bedraggled and very much irrelevant orthodoxy. All the while propping up and rationalizing our methods, our job, by saying we are listening to the students, we are listening to the data. However, the facts are out there for all to see. School is Kafkaesque, a nightmare we can’t wake up from. When I’ve asked the teachers in my curriculum development courses – they’ve almost all said they do needs surveys, they ask students, make changes. But if I ask deeper questions, it gets complicated. They still keep to a regiment, they still dictate that all students use x, y and z and better get to this or that objective. They are still steering the bus and unfortunately, I think too many students are being run over by it – however good their intentions. Even Dogme, the notion that students guide the learning and are the “material” is suspect. I’d even say, very “Apple” and “Steve Jobs”. At the end of the day, the dogme teacher is, well let’s be honest, “dogmatic” and espousing an approach. What about the students? What if they say, let’s use Touchstone? What then? I’m just throwing this out there so we might waken Freire from his grave. Truly question the power relationship in our classrooms. Because that’s very much why the “Expert” approach reigns despite all the pretense. And that is truly why too much of education is flywheel and not enough sparkplug. People are doing it for “power” not for the sake of learning. Something to think about – which side are you on? Previous story “Real” books …. I couldn’t resist chiming in on David’s comments with my own position that for the vast majority of people/contexts, there is (or at least should be) elements of BOTH of the Apple and Google philosophies at work. The fact is that many students (or “users” as the case may be) do not know what is possible or what they’re looking for. That’s when a “maven” (like Steve Jobs) – someone steeped in a certain subject, with vision and artistry, can quite literally lead the way. On the other hand, anyone who is not actively “listening” (actual listening, looking at analytics, reading customer feedback, etc.) to her students/customers these days is, well, asleep at the wheel and doing everyone a disservice. So, rather than one or the other (“Pen is mightier than Sword”), to me this is a clear case of the need for both (“Pen and Sword, in accord”). A bit of both, but generally I make classroom decisions based on my experience of what works. I’m the captain of the ship, but I certainly listen to my students as well. The students at my university have the freedom to give me a poor evaluation, which, if repeated a couple of times, would almost certainly result in me losing my job. I know that this does influence some teachers when they give out grades. I was surprised that you said “Of course, most teachers will say that they are the later, they are googlites, they listen to their students.” My experience of speaking to teachers is more mixed. Thanks for your “meaty” comment. It isn’t an easy thing, is it? Very situational and “depends” on a lot of things. I guess we are lucky enough when our job does allow us to decide things outside some strict set of parameters. You might be right about teachers listening to students. Maybe I get biased data as a teacher trainer – maybe the better teachers, maybe they want to please the trainer? I should be heading back into the trenches and staff room! Wonder what others think about this? I guess the proof is not in the pudding but in the eating – “how” it is done. Your analogue between customers and students is a good one – it asks many teachers to be more responsive than on whole they have been in the past….